S/Sgt. 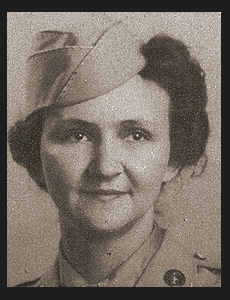 Flora Alexander Drain, daughter of Mr. and Mrs. E. E. Alexander, graduated from Wilson High School, Okla. A & M. Entered the Wacs in Oct, 1943, trained in Ft. Oglethorpe, Ga; served in Indiantown Gap, Pa. Awarded Good Conduct Medal, Am.Theatre Ribbon, Victory Ribbon.